Image caption Nicola Sturgeon said Scotland's work on public health policy was "world-renowned"
Other members include the President of Uruguay, a former Prime Minister of New Zealand and Norway's health minister. 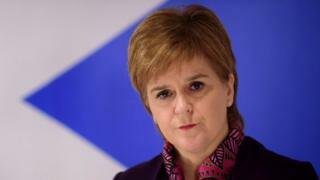 A spokeswoman said the first minister was chosen for the role due to her work on policies like minimum unit pricing. Mr Bloomberg, the 10th richest person in the world, is the World Health Organisation's global ambassador for so-called "noncommunicable diseases" - a set of chronic conditions which includes heart diseases, cancer, respiratory diseases and diabetes which are the leading cause of death in the world. He said there was "substantial evidence" that tax-based and fiscal policies were "essential" to confronting the "growing crisis" of these diseases, which are a particular issue in low and middle-income countries. Tobacco use, obesity and "risky" alcohol consumption have been identified as three leading risk factors for the development of these conditions, and Mr Bloomberg said the taskforce would "explore which policies can make the biggest difference and help them spread, saving millions of lives". Image caption Michael Bloomberg said the taskforce could save "millions of lives"
Ms Sturgeon said Scotland's work on public health was "world-renowned", and her spokeswoman said it was policies like minimum unit pricing for alcohol which had led to the invitation. The first minister said: "As part of our public health work, we have often collaborated with other nations and experts across the world, to learn from their approaches and to pass on our learning. "My experience of this dialogue is that it is both beneficial to Scotland and the nations we have been in discussion with." Lawrence Summers, a former chief economist of the World Bank who chairs the taskforce alongside Mr Bloomberg, said there was "strong evidence from around the world that raising taxes on products like tobacco, sugar-sweetened beverages and alcohol is highly effective in reducing harmful consumption and saving lives". Ms Sturgeon is one of two UK representatives on the taskforce, alongside Dame Nemat Shafik, director of the London School of Economics and former deputy director of the Bank of England. Other members include President Tabaré Vázquez of Uruguay, Norwegian health minister Bent Høie, Masood Ahmed, president of the Centre for Global Development, former New Zealand prime minister Helen Clark, and former WHO director general Margaret Chan.